Places of deposit are local archive services, other than The National Archives, which are appointed to hold certain classes of public records. 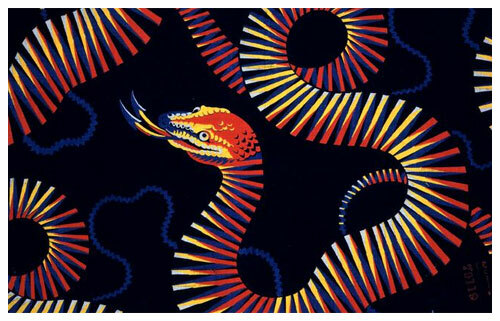 Six key steps need to be taken to successfully transfer records to an approved place of deposit. If you are unsure of the processes involved in locating, selecting and transferring your records and need advice and guidance, enrol on our short online training course to find out more. 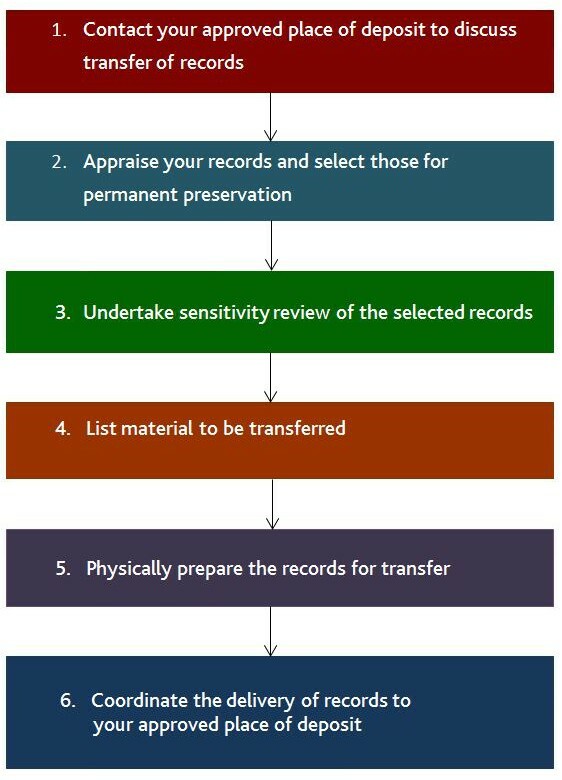 You can also view our brief guide to transferring records to places of deposit for further instructions. How do I find out who my place of deposit is? Take a look at our online application to find where you should deposit your records. If your organisation does not appear, or you think the information contained therein is incorrect, please contact us. How do I know which records should be selected for permanent preservation and transferred to my local place of deposit? How does the 20 year rule affect my organisation? The secondary legislation under The Public Records Act reduces the point at which public records are transferred to places of deposit from 30 to 20 years over a ten-year transition period. This means the period during which your organisation should select and transfer its records for historical preservation will be reduced by one year for each year of the transition. This means that during 2016 records dated up to and including 1987 and 1988 need to be selected and transferred to your place of deposit. A further two years’ worth of records should be transferred each year until 2024 when records from 2003 and 2004 will have been transferred. What is the Record Transfer Report for local bodies? Organisations including magistrates’ courts, coroners’ courts, prisons and NHS bodies can take part in The National Archives annual survey which helps to monitor organisations’ progress in moving toward the 20 year rule. Taking part will help your organisation demonstrate your compliance with the new legislation. Results of the 2015 survey can be found here. A total of £500,000 of ‘New Burdens’ funding has been made available from central government to cover the increased activity faced by coroners’ courts (being funding by their local authority) during the ten-year transition period. Distributed via The National Archives, £50,000 will be made available for each year of transition, with first payments being made in relation to public records selected and transferred for permanent preservation to places of deposit during 2015. Payments to individual coroner areas are allocated as a proportion to their share of the total volume of coroners’ records transferred under the Public Records Act to places of deposit. Details for the first year of payments can be downloaded below. The data shows the volume of coroners’ records transferred by each eligible court, the total payment received, and the place of deposit to which the records were transferred.